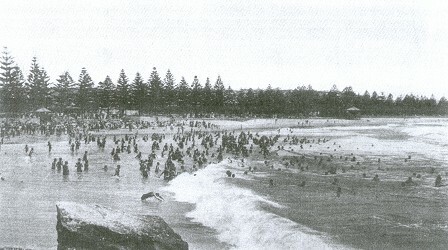 Phil Harris : Surf-Bathing in New South Wales, 1907. Harris, Phil: Surf-Bathing in New South Wales. There is probably no city with environs that offer more or better faculties for surf bathing than Sydney does. Within practically a few minutes journey from the city by boat, tram, or train there are many pretty sandy beaches where the great bounding sintillating Pacific roars forth its enticing lnvitation to, all. to come and part take of its refreshing, healthful qualitles. And the residents of the harbour city do not allow the invitation to go unheeded. Whenever opportunity offers they crowd to where the "great sea chafes and the white horses of the Pacific shake their sounding manes"; and throughout the summer months the numerous seaside resorts are thronged with thousands of frolicsome, hilarious bathers- young and old, male and female- eager for a share of the delights that the sea gratuitously offers to all. Although the municipal arrangements for the convenience of bathers may not be so elaborate as those in other parts of the world, there are few places where the breakers are more perfect or more beautIful, and where the beaches offer more natural advantages for surf-bathing. And the healthy, sun-tanned bodIes of the thousands of bathers who regularly flock to the more easily accessible beaches, their bnght, happy faces and blithe, buoyant spirits- pregnant with a sense of absolute freedom, unmarred enjoyment, complete diversion, exhilarating hilarity, and healthful excitement, which finds expression in joyous shouts as they press eagerly forward to meet the incoming breakers when they gather and swell, rise majestically and curl over and tumble and spread in sportive glee, foam-flecked, blue-green glories- afford eloquent testimony that Sydneyites are not wanting in appreciation of their glorious heritage. 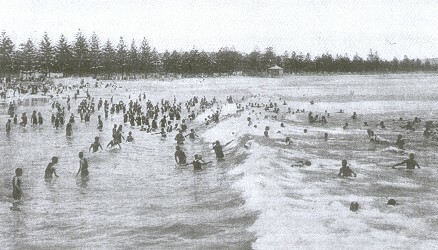 It is a welcome sign that the youth of New South Wales are becoming so universally addicted to surf-bathing- for there is no finer, no cleaner, no more invigorating, health-giving, and health-retaining pastime known to mankind, nor one freer from debasing influences and fuller of that which elevates and pleases. To the healthy, active youth who has once tasted of its delights, there is an accolt, irresistable allurement and entrancmg beauty in the ceaseless swish and roar of the breakers that draw him to them on every possible occasion. To him the sound of the restless surf is like the merry laughter of happy children at play, and the louder roar of the great breakers as they gather and fall is like the continuous approving applause and the joyful boisterous laughter of admiring parents at the playful antics of theIr offspring. THE COMPARATIVE SAFETY OF SURF-BATHING. It is a fallacy to think that surf-bathing is a highly dangerous pastime. The occasional publication of sensatinonal accounts of "bathing fatalaties"has had the effect of intimidating nervous people; but there is really less danger to life and limb in surf-bathing than there is in many other invigorating outdoor sports. Surf-bathing mishaps are almost invariably the outcome of wanton carelessness and utter lack of forethought; and they should not influence people against the enjoyment of that glorious sensation which peculiarly and particularly belongs to surf-bathing. To the level-headed bather, who keeps inside the further most point at which the waves break, and who exercises a reasonable amount of care and discretion, the past time possesses the minimum of danger. IN THE BREAKERS, MANLY, N.S.W. 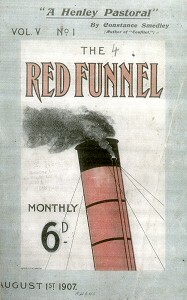 Photo by Hall & Co., Sydney. If a bather is uninitiated in those signs that point out unmistakably the position of the undertows and currents it is advisable for him always to follow the crows and keep well behind the outer line of bathers. Only capable swimmers, possessed of nerve and presence of mind, who understand how to tell where the undertows and currents exist, should be in this outer line. And even the best swimmers should not take unnecessary risks, for they are always liable to miscalculate the strength of the forces against which they pit themselves. Often a man will force his way through the line of breakers because he happens to possess a little more than the average strength and luck, or because the breakers seem to be not very strong, and with no small admiration of himself- which he wrongly supposes to be shared by the onlookers- he swims far out. While his luck stands by him he gets back safely, but one day he may fail to do so, or other people will have to risk their lives in the attempt to rescue him. ...healthful, harmless, and delightful pastime. But it cannot be said that the reckless individual who indulges in this sort of thing is surfbathing. Once outside the outer line of breakers, that made the indesrcribably pleasant sensation of being gathered up in the bounding, foam-crested breaker and taken in its mighty arms and rushed rapidly but gently along, and landed, unharmed and happy, on the beach, is entirely lost. Of course, there are undertows of more or less strength on every beach. They are caused by other breakers flowing back under the incoming ones, thereby setting up an undercurrent which drags the sand out with great velocity. Generally, the poundming of the waves causes the formation of a cavity, the dimensions of which depend on the force with which the breakers pound the sand. This gives the out rushing water additional impetus; and he is indeed a powerful swimmer who can successfully combat its force. Another source of peril to the unwary bather is the undercurrent. The danger from this cause is not nearly so great as that from the undertow, and a fair swimmer, with intelligence and presence of mind, can easily get out of its influence by lying on his back and floating along with the affected waters until its force becomes reduced, and then swimming out of the danger zone by striking out along the beach. The phenomenon of the undercurrent is caused by the waves which, through outside influences, approach the beach from different dlrection, converging and rushing back with great velocity between the incoming waves, with the effect of producing a current, the strength of which depends upon the force of the surf and the quantity of water influenced. The regular surf bather, however, learns to tell at a glance where these dangers exist, and he gives them a wide berth. Surf bathing is sometimes aluded to as "fightIng the breakers." The individual who sets out with the intention of combating the forces of the ocean will surely come out a bad loser. When treated properly there is nothing more pleasant and docile than a breaker. But it is a rough and relentless fighter. Learn to give it the treatment it requires and it is gentle, playful, and yielding. Try to fight it, and it is a raging, exasperated monster, eddying, rushing, fuming; and the offending bather will find hImself embraced tightly in its powerful, unyielding grip, and, like a powerless pigmy, dashed and tumbled about in its briny midst until, after numerous eccentric gyrations, it will throw him, bruised, choking, panting, and unhappy, on the beach. 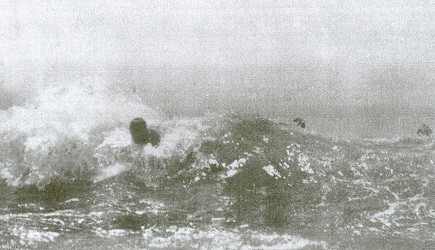 Before attempting to bathe in the surf, the novice must make up his mind that the pastime is not one in which merely nerve and physical strength are required. Surf-bathing has a scientific side. It requires skill, judgment, Presence of mind, and practice- skill in preserving the balance; judgment to know how, when, and where to take the breaker; and presence of mind to retrieve an error of judgment; while practice develops these qualities and teaches the bather to think and act quickly. Although to the outsider surf bathing may appear to be a very simple and unscientific pastIme, there are certain imperative rules which must be observed if one desires to obtain from it the fullest enjoyment and benefit. 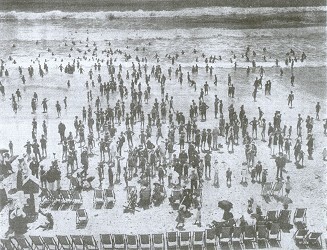 Even among regular surf-bathers there are very many who know nothing of the proper methods for negotiating the breakers. They may readily be discerned by the ungraceful and excitable manner in which they tumble and splash about at almost every breaker, while the advent of what the scientific bather would designate "a beauty" completely demoralises them, and generally lands them in ludicrous attitudes on the beach. A faithful observance of the rules herein laid down will save the novice many embarrassing up-endings and humiliating poundings in the sand. The first and primary factor to be considered by the surf-bather is the preservation of balance -that is, to be able to withstand the force of a rush of water without suffering an overthrow. This is possible only by judging correctly the force of the wave and exactly when it will break, and then acting with skill and expedition. The first is merely a matter of judgment- the force of the breaker will depend on the volume of water which it contains- and the ability to act with skill and expedition will come with practice. THE FINISH OF THE SHOOT. The most pleasurable and, in a rough sea, the most exciting, surf sport is "shooting " the breakers. Having judged where the wave will break, you hurry forward to the spot, and when it swells, preparatory to breaking, you throw yourself into it, and you will be gathered up in the rising waters and carried high on to its foamy crest. Then, as it curls over and falls, give a vigorous kick and straighten yourself out, with head shorewards and face downwards. Keep the arms rigidly at the sides, the palms of the hands turned outwards, shoulders high, and head well between them. This will allow you to obtain the greatest impetus from the incoming waters, and you will glide gracefully along with the shoulders level with the fringe that gathers in front of the broader mass of surf. When you feel yourself losing pace, bring your head and shoulders well forward, with the face under water, moving your head up and down quickly to breathe. On regaining your feet you will probably find that another wave is approaching, and that you will not be able to reach it before it breaks. Make towards it, and when you meet, by which time it will have broken and spread, turn with your right side towards it and spring into it, at the same time throwing the arm above and against the head, and, instead of being upset and tumbled about by the turbulent waters, you will cut right through them and land on your feet on the other side. You can then hurry forward and be in time to shoot the suceeding breaker. ... body, or if the volume of water be great, swim hard through it, being careful to keep directly head on. Be sure to dive deep down, to escape the perturbed surface water and to prevent collision with other bathers who are shooting in. ThIs is the most difficult method of all, and the novice will have to exercise care in performing it. If you are too far out for shooting- that is, if the breaker is going past you before curling over and spreading -the best plan is to "ride" it. when it meets you spring forcibly, and it will carry you gracefully into its summit, and, continuing on its onward course, let you glide gently down on the other side. Don try to shoot when you are too far out; either adopt the above method or dive through the wave. If there are two or more large billows approaching in rapid succession (large breakers generally come in threes) it is advisable to dive through the foremost of them and shoot on the last. The last is generally the largest, and therefore the best for shooting on. An ingenious little contrivance for assisting the bather in shooting, is an oblong board, about twelve by sixteen inches in dimensIon. This is held out in front of the bather, and, kept in front of the incoming surf, it produces the maximum of speed for the minimum of exertion. The board requires some practice for its successful manipulation, and it is not permissible on crowded beaches, where it is sure to interfere with other bathers. No doubt, with the knowledge that l comes from experience, the bather will discover new methods, but I am sure he will always find that those indicated above are the most useful. a decision by actual experiments in the breakers. ... quickly which method he will adopt, and act with decision and judgment. The necessity for exercising care and prudence cannot be too often or too forcibly impressed upon surf-bathers. Thoughtless persons frequently allow their better judgment to be overcome by a desire to impress their friends with a sense of their skill. Stupidity is not courage: and carelessness or recklessness may possibly be the cause of bringing into reproach one of the healthiest and most invigorating of pastimes. IN THE WAKE OF THE BREAKERS. 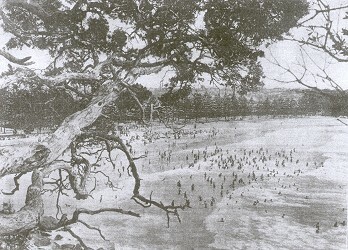 Geoff Cater (2008) : Phil Harris : Surf-Bathing in NSW, 1907.